Fresh water contributes to a better health for your dog. With the Fountain Fresh from AFP, your dog can drink fresh, filtered water at any time in the day. The filter is available separately. 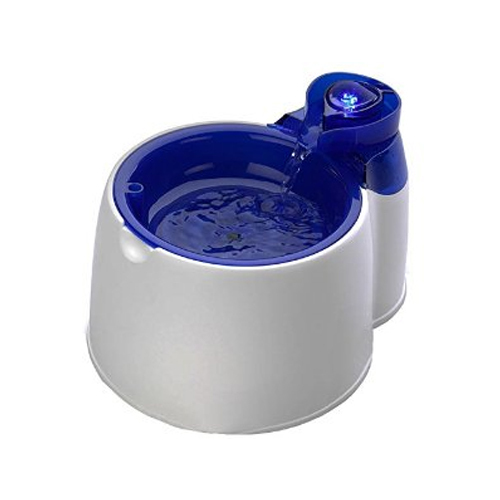 The All For Paws Fountain Fresh provides your dog with fresh, flowing and filtered water. The filter system consists of a foam and carbon filter in one. The filter ensures that no dirt, food, hair or sediment ends up in the water. Changing the filter is easy and it is recommended that you do this once a week. The drinking fountain also has LED lighting, making the fountain visible and extra appealing in the dark as well. Flowing water contributes to a better health for your pet. The flowing water ensures that your dog can see the water properly, which is not always the case for stagnant water. Because the water is constantly flowing, it attracts oxygen. The clean, flowing and oxygen-rich drinking water helps prevent health problems and stimulates your pet to drink more water, which also contributes to a good health. Have you used AFP Fountain Fresh before? Let us know what you think about this product.